Products that received at least 10 published parent reviews with an average rating above 4/5. This product is fab to start weaning baby. The spoons are perfect to start with. The bowls come with lids, which makes it so easy to pop a snack in and take it with you wherever you go. Small and compact and the lids are fab. My daughter loves these spoons as great shaoe to eat off of as other spoons are too big. Love the bowls as jist right size and great that comes with lids. These are brilliant value for money!! We’ve used these for both of our babies! There so small but can fit a fair amount in! There so good if you batch cook and freeze and when you want to use again are microwave safe! The spoons are the best that we’ve brought more of the same brand! There safe to use. Highly recommend! Good portion sized bowls, perfect with the lids as can be frozen in portion sized amounts. Washed well in the dishwasher and stands up well to microwaving. Good value for money especially with two spoons included too. Spoons good size for small mouths! I loved using these with my little boy, the spoons are brilliant and soft. He could also easily try and feed himself which he loved doing. These bowls hold a full meal for my son and I have been using to transport food between places. I also store food in freezer in them the only downside is that they seem to stain with stronger coloured food. Tips on removing these stains would be appreciated. The shaping of the inside of the bowls mean they're a lot easier to wash out. They stack easily so that's great for storage! The size of them is just right for portion measurements! I really love those pot, colorful, perfect size for my daughter and spoons are very perfect ! Lids are secure for travel but a little bit strong to close. Really good bowls for weaning but when my baby started eating more they were only good for snack pots. The lids are not very easy to put on but when on they don’t come off accidentally. The spoons are not good at all, they are too flat so food falls off very easily. Great value for money set - perfect for when you start weaning. Love that the bowls have lids so they're perfect for on the go or for storing food in the fridge/freezer. 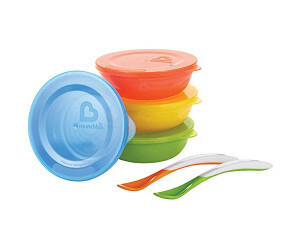 The bowls are a great size for weaning babies and the lids secure nicely for travel so your bag doesn’t get messy. Love these bowls. Great in the microwave. Have a lid to use for travelling around. Easy to store and hold just the right amount of food needed. Me and my little boy love these bowls. They are the perfect size for meals for little tummies. The lids mean that if I make too much I can store a meal in the fridge for later/ the next day. 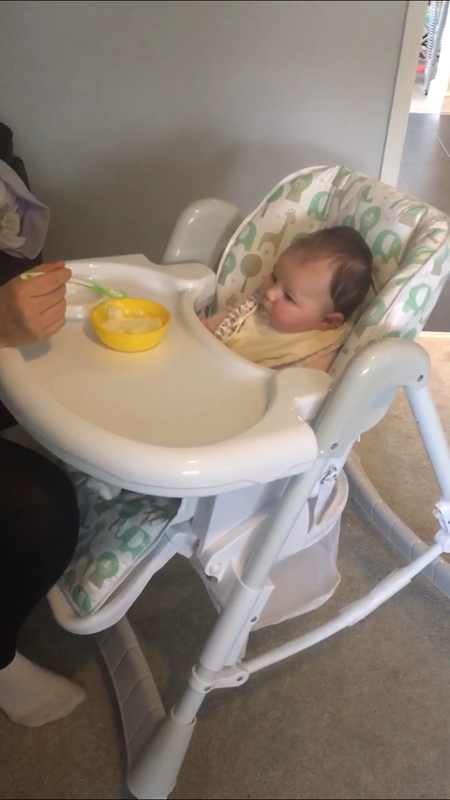 The spoons make feeding easy and are perfect even for the smallest of mouths. 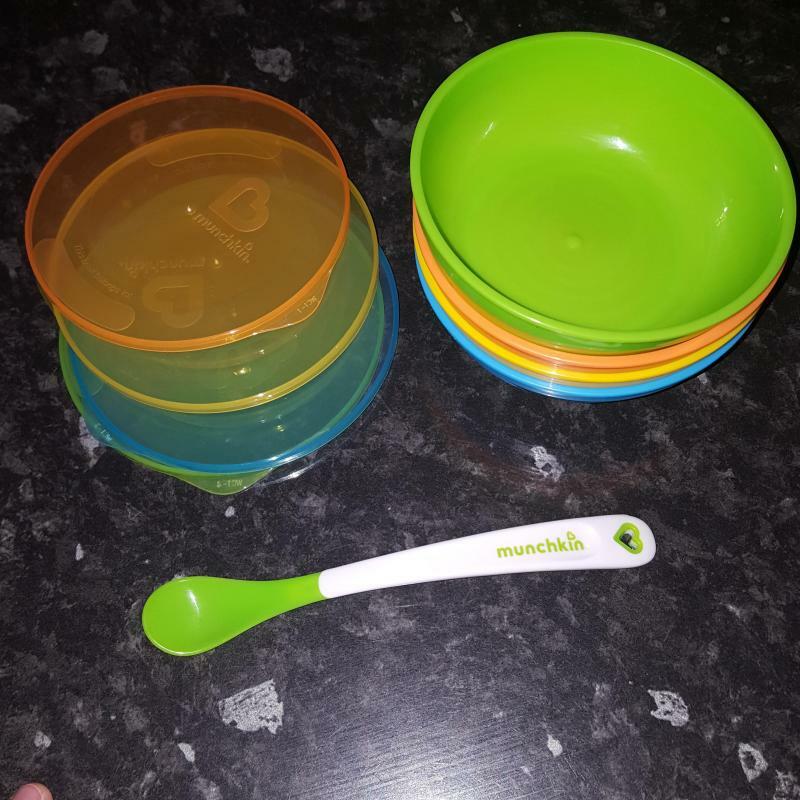 I used these bowls and spoon for my baby these are fabulous i love them very useful and giod products easy to wash and used as well. Rest of food you can securely tied with lid and place it in fridge. Spoon is very flexible and soft. I love this set. Very cheap in price. I think this bowls and spoons are the best of babys feeding staff, long time i was searching good spoons, and now i found it. My baby like it. Very good colours and easy to use. Ideal for travel and ideal to use home as well. I brought these from Amazon's black Friday sale for cheap and thought 'they'd do', but they have been perfect. The lid is water tight so I can add my baby's lunch and pop them in my bag for later without a worry. 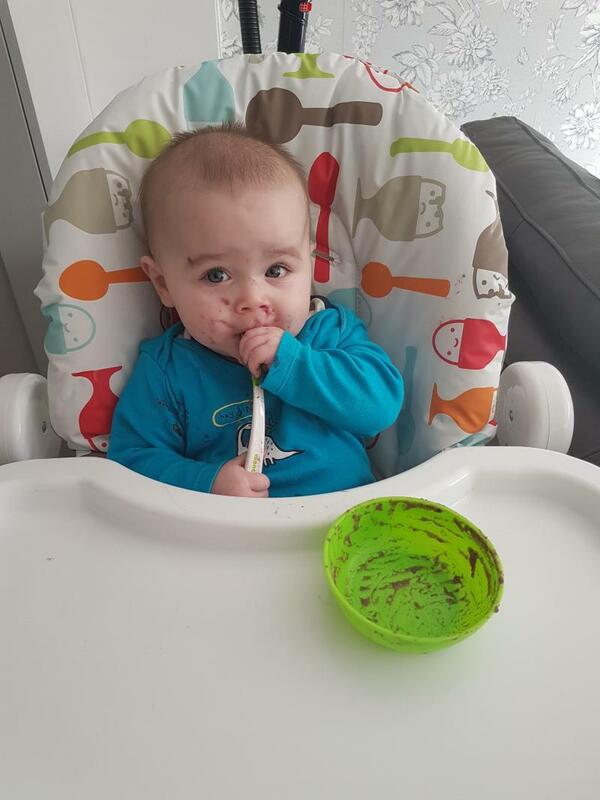 The bright colours keep my baby interested in them and the spoons are a perfect size for my baby's mouth and hands. Easy to clean. Good size bowl and spoon tips for first meals for baby. Great price. Fast delivery. Spoons are PERFECT for starting to wean baby and she loves holding them herself. Bowels work really well - took a bit of time to fit lids on. This is because they are really tight fitting to make sure there is no spillage. They have never leaked so I'm pleased! I bought these from Amazon as they were great value for money. We often go out and these bowls are so handy to store food. The lids snap on the bowls really easily and keep the food secure. The soft tip spoons are excellent, I’ve bought more of them! Really helpful as LO is teething so other spoons irritate his gums! 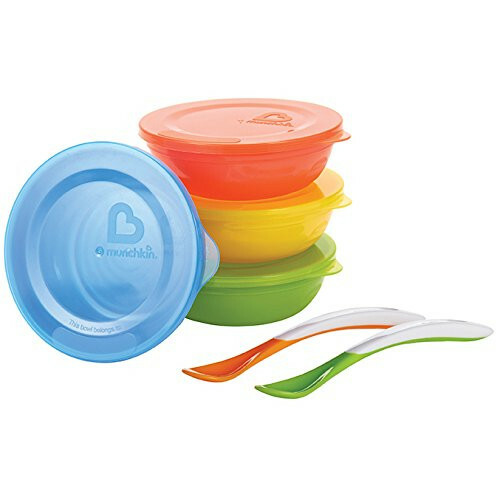 I got these for my 10 month old daughter as she’s eating a lot more thoughout the day instead of drinking milk so we needed more bowls, preferably with lids so I could take food out and about. I found these bowls to be practically perfect in every way - the bright colours were attractive to my little one, ensuring she had an interest in what was in front of her. The lids ensured there were no spills or leaks in her changing bag. They hold a good amount of food and are perfect for snacks, meals on the go or left over dinners! Would 100% recommend these bowls.